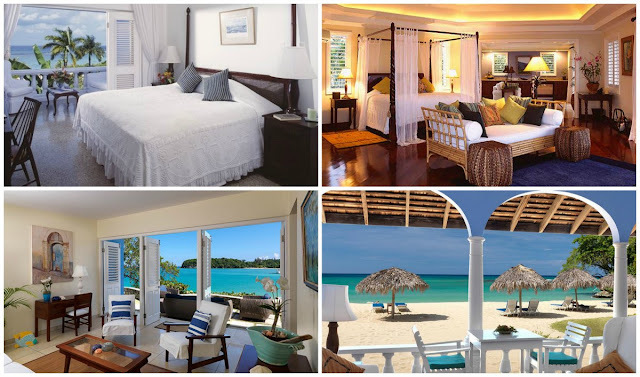 Since 1950, Jamaica Inn in Ocho Rios has ranked among top luxury hotels in the Caribbean, and this small luxury hotel is as timeless today as it was in 1950. Having spent my honeymoon at Jamaica Inn decades ago, and returned for several visits afterwards, I highly recommend this property. If you are yearning for vacation where you can truly get away from all the stress of your daily lives . . . There are only 48 intimate suites and cottages, no TVs, radios or clocks. On this secluded beach the sounds are from the gentle waves of the Caribbean Sea, tropical birds, and nightly music at dinner under the stars. You will be greeted warmly once you arrive, and after getting settled in you will be made to feel like one of the family as the staff attends to your every need. While this is small boutique luxury resort, the atmosphere is never stuffy and I would be describe it as laid back elegance. The waters on the secluded beach are calm, and the landscaped grounds are immaculate. Nature lovers will appreciate over 20 species of tropical birds which make their home at Jamaica Inn. In room amenities include air conditioning, beach towels, ceiling fan, complimentary Wi-Fi, hair dryer, mini fridges (stocked on request), phone, robes, safe, toiletries, and turndown service. In the open air restaurant Chef Maurice Henry changes the menu nightly featuring international cuisine infused with local Jamaican flavors. There is a dress code after 7 p.m., however guests have the option for less formal dress dining on your verandah or on the beach for all meals. Complimentary afternoon tea and light snacks are served daily on the cocktail terrace. Take advantage of The Ocean Spa at Jamaica Inn which offers a full menu of spa treatments sourced from local organic farmers. The longer you stay, the more free nights you earn and the more beach time you receive! This offer is available in all suites and cottages for single or double occupancy on a room-only basis. And there's a September & October Bonus! Stay during the months of September or October 2018 and receive BONUS food and beverage credits to use during your stay. All credits will be automatically applied to your reservation.